What a mouthful of a title, eh? 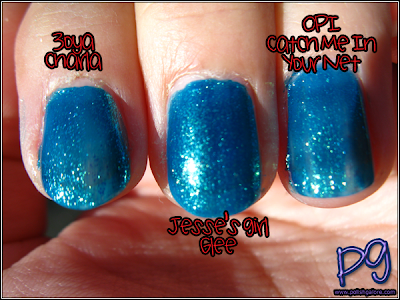 As I mentioned before, Jesse's Girl Glee was very familiar so I went pulling through my colors after remembering how similar Zoya Charla and OPI Catch Me In Your Net were. Whoa, blue green glitter mermaid overload! Yes? 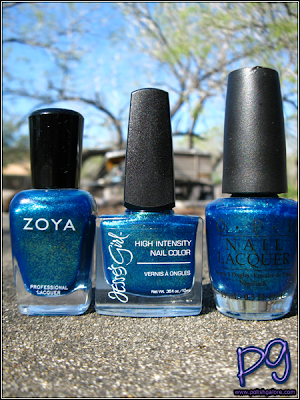 For Zoya's Charla, I used a base of Zoya Anchor, 2 coats of Charla and a top coat of Zoya Armor. 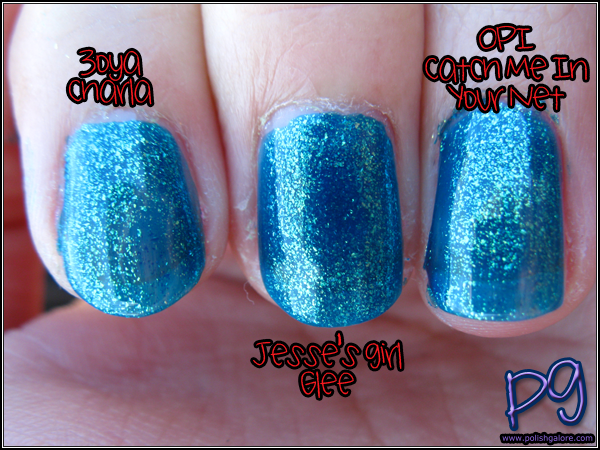 For Jesse's Girl's Glee, I used a base of Seche Natural, 2 coats of Glee and a top coat of Seche Vite. For OPI's Catch Me In Your Net, I used a base coat of OPI Natural Nail Base Coat, 2 coats of Catch Me In Your Net and a top of OPI Top Coat. For reference, Zoya Charla is available for $7, Jesse's Girl is available for $2.99, and OPI sells for about $8.50. One again, this color doesn't like to focus with my camera. I think the results speak a bit for themselves. While you can see a bit of VNL with all three, Glee is more opaque than Charla, and Charla is more opaque that Catch Me In Your Net. In the shade, it appears that Glee has a slightly darker base than Charla but again, the VNL is showing a lot on Catch Me In Your Net. I have Charla and found the best dupe to be Essence Choose Me! I just bought glee and I'm glad I bought that one out of the three I hate seeing my nail line!! It drives me up a wall since my nails are so long!